For a long time, we’ve been thinking about the needs of digital health, and what we can do to help. At last, we got it: we want to be your bridge. How? By connecting the actors of the digital health ecosystem, and offering high-quality information to help detect opportunities. In short: we make things happen. 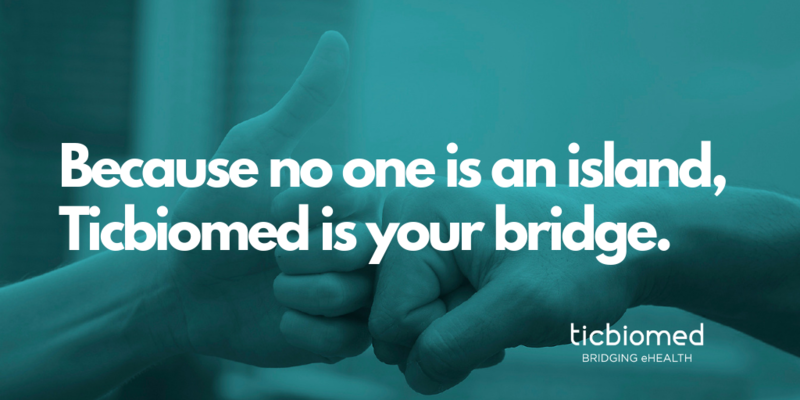 Now, we are Ticbiomed: Bridging eHealth. We are eHealth linkers, and you can always count on us. The 10 reasons why we believe in digital health and we are committed to thos innovative healthcare professionals leading the digital transformation in healthcare. Here you’ll find out what we can do for you and our projects to make digital health grow. Each member of our staff has chosen their top ten hits. Turn the volume up and click on play! AND THANKS FOR LEADING THE CHANGE.